Adusted colors, curves, levels, USM, dodge and burn, blured out the rest of the leaves near by, cloned out just a small anoying part of another sipral. Can someone suggest software to use to print my pictures, i'm new at this i heard photoshop 7 but now i'm hearing photoshop cs ? I adore that, I wish I could be as good =). Beautiful man, Beautiful!! Yanik you always surprise me by coming out with such masterpieces! A fine image well deserving of the blue ribbon! Wow - I didn't get to vote on this challenge, but now that I'm looking, this entry knocks my socks off. Congrats on the well-deserved blue. Very unusual and beautiful. congrats! fabulous entry - well deserved blue! And for those who thought that I sprayed the water on.... nope. It was after the rain and it was still drizling when I took the shot. Beautiful. The more I look at it the better I like it. Congratulations. Congratulations! A well deserved win. Fabulous and surreal and lovely, Yanik! Way to go! Congrats on the win...again its beautiful. Beautiful image. wonderful detail and excellent color. I really like this. So much going on (lines, shadows, blobs and curls) but despite all that still very calm. 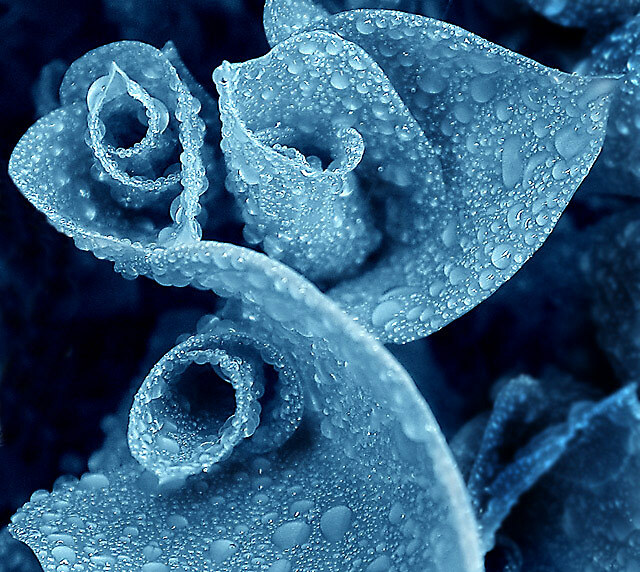 Cold blue toning enhances the feeling the waterdrops create. Nice composition, good exposure, excellengt toning. It's a wonderful composition that makes you wander around the drops. The unusual color makes it very unique. I know it's really tough with macro to get much DoF, but that closest diagonal line needs to be crisp. Too bad you didn't have a lens that would stop down to f64! Exposure is spot on. Overall - an excellent job! Nice. I like the blue duotone effect, too. A little overkill on the water drops, and the blurry petal edge right down the center is unfortunate. Still a fine entry. Very observant catch of three. The water spots and color don't look natural. It looks like you sprayed the drops on and color shifted the shot. very very interesting composition and subject matter. nicely done with the lighting and dof too. What a compelling image. AMAZING! This seems unnaturally wet, did you squirt water on it? Lovely nevertheless. Wow - what a beautiful photo! The only thing I would change about it is the harsh glare on some of the droplets since it conflicts with the soft tone of the photo, but I imagine that's from the sun, which you don't have much control over. But that's a tiny point. This is a really great shot. Compliments only.....it's fantastic. Top three. Interesting shot - the leaves are so wet they almost look frozen! Intersting color as well. great photo! love the coloring, and excellent detail! Brrrr. The color of this makes me feel cold. This is beautiful! Quite unusual color and interesting...nice shot! Proudly hosted by Sargasso Networks. Current Server Time: 04/21/2019 04:11:01 AM EDT.